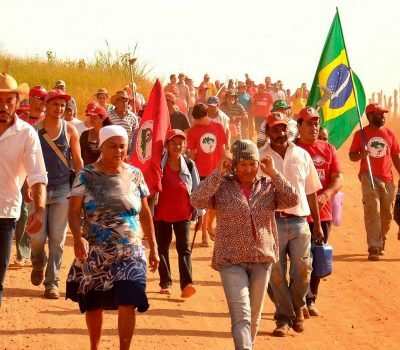 We, the MST families of Southern MG, of Quilombo Campo Grande, denounce fascist action against our 20-year struggle. Here, families, after so many years, already have electrical energy infrastructure, houses and produce a great diversity of agroecological production, such as coffee, many varieties of corn, beans, vegetables, fruits, organic seeds livestock, chickens, pigs. These families generate, with their work, food sovereignty, not only for those who produce and live on the land, but for thousands of people who have access to a healthy and quality food, without poison. The camps also generate income distribution. The land, which was only of one owner, now brings dignity to nearly 450 families, more than 2,000 people who were almost having their dream of having possession of the land carried out by a state decree. But now, through a legal conspiracy between the big landowners, deputies of the ruralist group and agribusiness companies in the region, they are organizing an eviction process for the families that live and resist throughout these 20 years of struggle. Two months ago the families had been settled and now they can lose everything they have built over the years. This is one of the oldest agrarian conflicts in the country. The fight for Agrarian Reform is the Fight for Democracy!